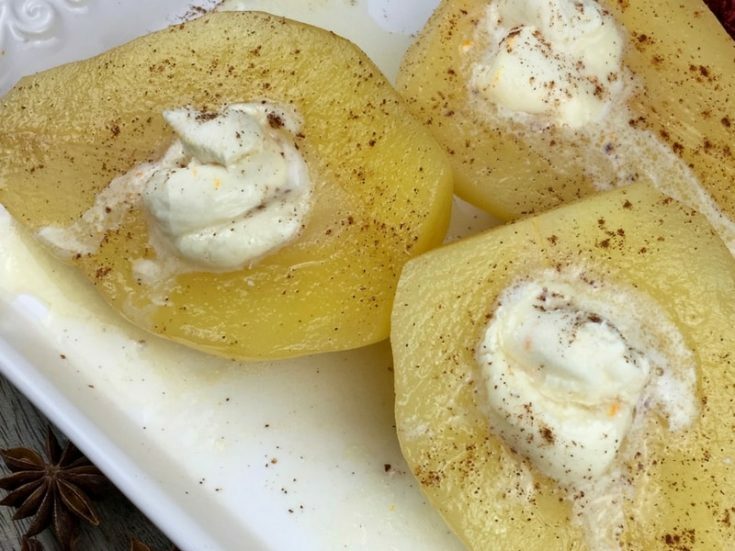 I love these easy poached pears! Very easy to make and they don’t pack a lot of calories like other desserts can. This elegant and easy dessert looks so much more complicated than it actually is! The key to success with this recipe is to choose a naturally firm pear variety (I used a red Anjou). You also want to use pears that are not quite ripe for this dish. Softer pear varieties and/or overly ripe ones have a tendency to turn to mush while cooking, so it pays to choose carefully while shopping. Combine water, honey, cinnamon sticks, cloves, and star anise in a large skillet with high sides. Bring the mixture to a gentle simmer over medium heat and cook, stirring occasionally, until the honey is melted and the spices become fragrant, approximately 5 minutes. Remove pears from heat and cool slightly. Serve immediately with a spoonful of the honey mascarpone cream and a dash of cinnamon. Top with a drizzle of the poaching liquid, if desired.